Maximum number of stored files SD memory card	2 Gbytes	: 511 Number of books that can be stored in this root folder. Maximum number of stored files SD memory card	4 G, 8 G, 16 G bytes	: 65534 Number of books that can be stored in this root folder. Holding method	: Large Capacitor Capacitors Keep the clock data using the power stored in the large capacity capacitor built in the PLC. If the voltage of the large capacity capacitor drops, the clock data will not be retained properly. The capacitor hold period is 10 days (ambient temperature: 25 � C) at full charge (when the sequencer is energized for more than 30 minutes). The holding period by the capacitor varies with ambient temperature to be used. If the operating ambient temperature is high, the holding period will be short. Power failure holding capacity	: Up to 12K word device (high speed) It is possible to hold power outage of all devices in the area. When using a battery, you can also hold devices in the device (standard) area. Input relay (X)	Octal number	: The total of X and Y allocated to 1024 points I / O is 256 points at the maximum. Output relay (Y)	Octal number	: The total of X and Y allocated to 1024 points I / O is 256 points at the maximum. Internal relay (M)	Decimal number	: 32768 points (It can be changed by parameter) It can be changed by parameter within the capacity range of CPU internal memory. Latch relay (L)	Decimal number	: 32768 points (It can be changed by parameter) It can be changed by parameter within the capacity range of CPU internal memory. Link relay (B)	Hexadecimal	: 32768 points (It can be changed by parameter) It can be changed by parameter within the capacity range of CPU internal memory. Annunciator (F)	Decimal number	: 32768 points (It can be changed by parameter) It can be changed by parameter within the capacity range of CPU internal memory. Link special relay (SB)	Hexadecimal	: 32768 points (It can be changed by parameter) It can be changed by parameter within the capacity range of CPU internal memory. Timer system (timer (T))	Decimal number	: 1024 points (It can be changed by parameter) It can be changed by parameter within the capacity range of CPU internal memory. Integration timer system (Integration timer (ST))	Decimal number	: 1024 points (It can be changed by parameter) It can be changed by parameter within the capacity range of CPU internal memory. Counter system (Counter (C))	Decimal number	: 1024 points (It can be changed by parameter) It can be changed by parameter within the capacity range of CPU internal memory. Counter system (Long counter (LC))	Decimal number	: 1024 points (It can be changed by parameter) It can be changed by parameter within the capacity range of CPU internal memory. Data register (D)	Decimal number	: 8000 points (It can be changed by parameter) Within the capacity range of CPU internal memory, it can be changed by parameter. Link register (W)	Hexadecimal	: 32768 points (It can be changed by parameter) It can be changed by parameter within the capacity range of CPU internal memory. Link special register (SW)	Hexadecimal	: 32768 points (It can be changed by parameter) It can be changed by parameter within the capacity range of CPU internal memory. Index register (Z)	Decimal number	: The 24-point index register (Z) and the long index register (LZ) can be set to a total of 24 words or less. Long index register (LZ)	Decimal number	: The 12-point index register (Z) and the long index register (LZ) can be set up to a total of 24 words or less. File register (R)	Decimal number	: 32768 points (It can be changed by parameter) It can be changed by parameter within the capacity range of CPU internal memory. Allowable momentary power outage time	: Operation continues with an instantaneous blackout of 10 ms or less. When the power supply voltage is 200 V AC system, it can be changed from 10 to 100 ms by the user program. DC 24 V service power capacity	: [When service power is used for input circuit] Ambient temperature 0 to 55 � C: 600 mA Ambient temperature 0 � C: 300 mA [When external power supply is used for input circuit] Ambient temperature 0 to 55 � C: 740 mA Ambient temperature 0 � C lower: 440 mA * 24 VDC The service power is consumed when connecting the I / O unit, etc., and the available current decreases. 5 V DC internal power capacity	: 1100 mA * Power capacity to be supplied to I / O unit, intelligent function module , expansion adapter and expansion board. For details, refer to the MELSEC iQ - F FX5U User "s Manual (Hardware Version). Input response frequency X000 to X007	: When loading pulses of response frequency of 50k to 200kHz using 200kHz input X000 to X007 (FX5U - 32M ? : X000 to X005), do as follows. ? Set the wiring length to 5 m or less. ? Use a shielded twisted pair cable for the connection cable. Also, please shield the shielded wire shielding on one side with the CPU unit side. ? Connect a bleeder resistor of 1.5 kO (1 W or more) to the input terminal and set the load current of the open collector transistor output of the equipment to be connected together with the input current of the main unit to 20 mA or more. The above limitation may vary depending on the specifications of the equipment (encoder etc.) to be connected. Adjust the cable length and load according to the equipment to be connected. Input response time (digital filter setting value)	: None, 10 �s, 50 �s, 0.1 ms, 0.2 ms, 0.4 ms, 0.6 ms, 1 ms, 5 ms, 10 ms (initial value), 20 ms, 70 ms Please set the digital filter when using in an environment with a lot of noises. Scan monitoring function (watchdog timer setting)	: By monitoring the scan time, abnormality of the CPU unit hardware and program is detected. Clock function	: It is used for time management in the functions performed by the system, such as date in error history. Write during RUN	Changing the circuit block during RUN	: Writes the part edited on the ladder edit screen on the engineering tool to the CPU unit on a circuit basis. You can write the contents edited across multiple places to the CPU unit at the same time. Interrupt function	Multiple interrupt function	: If another factor interrupt occurs during execution of the interrupt program, execution of the program with the lower priority is interrupted according to the set priority, and the program with the highest priority where the execution condition is satisfied is executed. PID control function	: PID control is performed by PID control command. Constant scan	: Repeat the program while keeping the scan time constant. Remote operation	Remote RUN / STOP	: With the RUN / STOP / RESET switch of the CPU unit in the RUN position, put the CPU unit in the RUN / STOP / PAUSE state from the outside. Remote operation	Remote PAUSE	: With the RUN / STOP / RESET switch of the CPU unit in the RUN position, put the CPU unit in the RUN / STOP / PAUSE state from the outside. Remote operation	Remote RESET	: When the CPU unit is in the STOP state, reset the CPU unit by an external operation. Device / label memory area setting	: Set the capacity of each area of ​​device / label memory. Device initial value setting	: Set the device to be used in the program to the device without programming. Latch function	: Even when the power is turned off ? ON, power outage of the contents of the device / label of the CPU unit is maintained. Memory card function	SD memory card forced stop	: Even if you are using the function using the SD memory card, you can stop using the SD memory card without turning off the power. Memory card function	Boot operation	: The file stored in the SD memory card is transferred to the transfer destination memory automatically determined by the CPU unit when the power supply of the CPU module is turned off, turned on, or reset. Device / label access service processing setting	: Set the number of times of execution of device / label access service processing executed by END processing with parameters. RAS function	Self-diagnosis function	: The CPU unit itself diagnoses the presence or absence of abnormality. RAS function	Error cancellation	: Cancel all occurrence continuation errors at once. Security function	: It prevents theft, falsification, misoperation, illegal execution, etc. by illegal access from a third party against the customer"s assets stored in the personal computer and the customer"s assets in the unit in the FX 5 system. Internal I / O function	High speed counter function	: High-speed counter, pulse width measurement, input interrupt, timer interrupt, high-speed counter interrupt, etc. can be performed using input of CPU unit. Internal I / O function	Pulse width measurement function	: High-speed counter, pulse width measurement, input interrupt, timer interrupt, high-speed counter interrupt, etc. can be performed using input of CPU unit. Internal I / O function	Input interrupt function	: High-speed counter, pulse width measurement, input interrupt, timer interrupt, high-speed counter interrupt, etc. can be performed using input of CPU unit. Internal I / O function	Timer interrupt function	: High-speed counter, pulse width measurement, input interrupt, timer interrupt, high-speed counter interrupt, etc. can be performed using input of CPU unit. Internal I / O function	High-speed counter interrupt function	: High-speed counter, pulse width measurement, input interrupt, timer interrupt, high-speed counter interrupt, etc. can be performed using input of CPU unit. Internal I / O function	Built-in positioning function	: Using the transistor output of the CPU unit, positioning operation of up to 4 axes can be performed. Internal I / O function	PWM output function	: PWM output can be performed using the transistor output of the CPU unit. Built-in analog function	Analog input function	: Two analog inputs are built in the FX5U CPU unit and voltage input is possible. Built-in analog function	Analog output function	: One analog output is built into the FX5U CPU unit and voltage output is possible. Built-in Ethernet function	: It is Ethernet related function such as MELSOFT product and connection with GOT, socket communication etc. Serial communication function	: Simple PC link function, MC protocol, inverter communication function, non-procedural communication and other serial communication related functions. 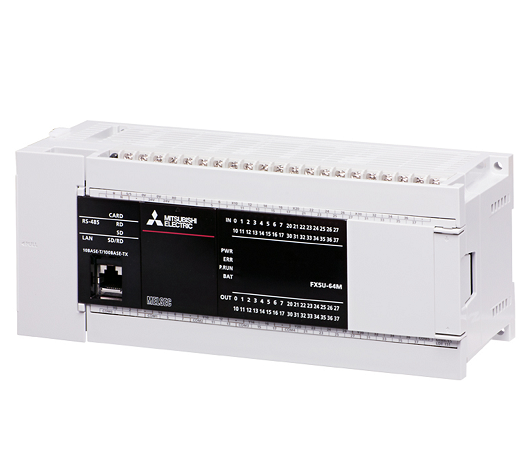 MODBUS RTU communication function	: It is possible to connect with MODBUS RTU compatible products. Master and slave functions can be used. Operating ambient temperature	: -20 to 55 � C, no freezing There is derating of input and output. For details, refer to the MELSEC iQ - F FX5U User "s Manual (Hardware Version). Products manufactured before June 2016 will be 0 to 55 � C. For the intelligent function module, refer to the manual of each product. Also, the following devices can not be used when the ambient temperature is lower than 0 � C. Battery (FX3U - 32BL), SD memory card (NZ1MEM - 2GBSD, NZ1MEM - 4GBSD, NZ1MEM - 8GBSD, NZ1MEM - 16GBSD, L1MEM - 2GBSD, L1MEM -4GBSD), FX3 extension unit, the terminal unit, input and output cable (FX-16E-500CAB-S , FX-16E- ? CAB, FX-16E- ? CAB-R) when used in less than 0 ? have different specifications I will. For details, refer to the MELSEC iQ - F FX5U User "s Manual (Hardware Version). Ambient operating humidity	: 5 to 95% RH, no condensation When using in a low temperature environment, please use in an environment where there is no sudden temperature change. If there is a sudden temperature change due to opening / closing of the control panel, condensation may occur, which may cause fire, malfunction or malfunction. Also, in order to prevent dew condensation, please dehumidify with air conditioning. Anti-vibration When DIN rail is installed Frequency: 5 to 8.4 Hz	: One amplitude: 1.75 mm 10 times in each of X, Y, Z directions (80 minutes in total) When judging criteria include the equipment with the above vibration specifications according to IEC 61131-2 in the system, the vibration- It will be reduced. Anti-vibration When DIN rail is installed Frequency: 8.4 to 150 Hz	: Acceleration: 4.9 m / s 2 10 times in each of X, Y, Z directions (80 minutes in total) When judging criteria include equipment with the vibration specifications or less specified by IEC 61131-2 in the system, the vibration- It is reduced to specifications. Anti-vibration Direct installation Frequency: 5 to 8.4 Hz	: One amplitude: 3.5 mm 10 times in each of X, Y, Z directions (80 minutes in total) When judging criteria include devices with the vibration specifications or less according to IEC 61131-2 in the system, the vibration- It will be reduced. Anti-vibration Direct installation Frequency: 8.4 to 150 Hz	: Acceleration: 9.8 m / s 2 When the judgment criteria include the equipment with the above vibration specifications according to IEC 61131 - 2 in the system, the vibration proof specification of the entire system is reduced to the specification of the device. ground	: Class D grounding (grounding resistance: 100 O or less) � As much ground as possible, use exclusive grounding. When it is not possible to obtain exclusive grounding, please use common ground (see the manual for details). � Use grounding wire with a thickness of AWG 14 (2 mm 2 ) or more. � Keep the ground point as close as possible to this sequencer and shorten the distance of the grounding wire. Use elevation	: It can not be used in environments pressurized to 0 to 2000 m atmospheric pressure or higher. It may break down. Over voltage category	: II or less Indicates where the equipment is supposed to be connected to the power distribution part from the public power distribution network to the mechanical equipment in the premises. Category II is applicable to equipment supplied from fixed equipment. The surge withstand voltage of the equipment rated up to 300 V is 2500 V.
Pollution degree	: 2 or less Indicates the degree of generation of conductive material in the environment where the equipment is used. Pollution Degree 2 produces only nonconductive pollution. However, it is an environment where temporary conduction can occur by accidental condensation.